Danny Anderson (left) and Josephine Keefe star in Bug at the Spokane Civic. "Lovers and madmen have such seething brains, such shaping fantasies, that apprehend more than cool reason ever comprehends," says Theseus in Shakespeare's A Midsummer Night's Dream. The madman, he claims, "sees more devils than vast hell can hold," whereas the lover sees beauty where none is evident. And what about when lovers also happen to be madmen? Does that make for delusions with twice the intensity? Judging from Bug, that would certainly seem to be the case. Tracy Letts' 1996 play, now in a four-week run at the Spokane Civic Theatre under the direction of Marianne McLaughlin, portrays a downward spiral into psychosis that's accelerated by the seething brains and shaping fantasies of a vulnerable, down-and-out couple, Agnes (Josephine Keefe) and Peter (Danny Anderson). 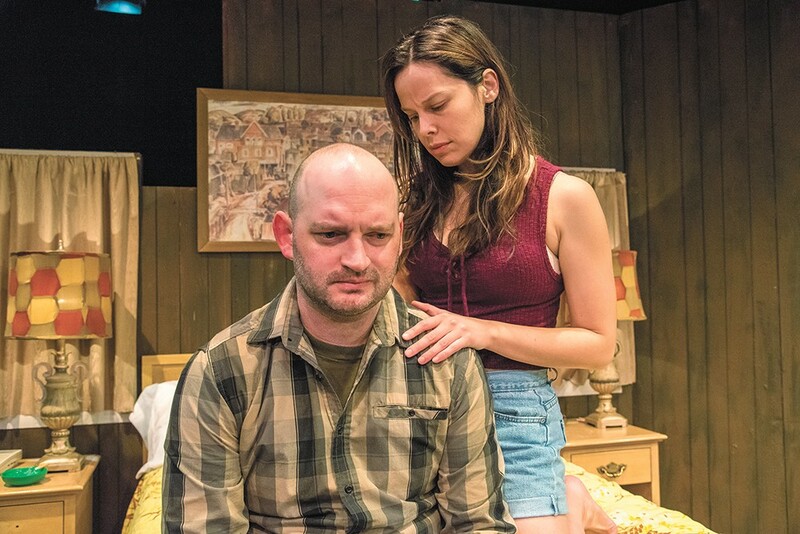 The setting is a run-down motel room in Oklahoma, signified in part by the liquor bottles, blackened crack pipes and ashtrays that sit atop the dated furniture of David Baker's set. Just over the strains of country music and beyond the cheap, wood-paneled walls is the sound of cars whooshing past on some anonymous highway. Our introduction to Agnes is wordless. She quietly drifts around the room until her quiet drifting is interrupted by the sudden ringing of the bedside telephone. When Agnes repeatedly encounters an ominous silence on the other end of the line, we're immediately knee-deep in foreshadowing. Later we meet Agnes' friend R.C. (Emily Jones), a biker whose lesbianism is a superfluous detail masquerading as a vital character trait. It's R.C. who introduces Agnes to Peter, an aloof, benignly odd stranger who nevertheless appears to be sensitive, respectful and comfortingly uncomfortable in his own skin — the polar opposite of Goss (Billy Hultquist), Agnes' volatile ex, recently granted early parole and the most likely perpetrator of the creepy phone calls. The relationship between Agnes and Peter begins ordinarily enough. Initially they're each a little wary of one another, reluctant to reveal the personal secrets they're harboring. Those secrets slowly, then quickly become the basis for their intimacy, binding them to one another ever more tightly. After Peter awakens one night to phantom — or maybe not — bug bites, it develops into a bloody, paranoid narrative that follows what the philosopher Michel Foucault described as "the marvelous logic of the mad," culminating in the "hidden perfection of a language" that, crucially and fatally, only Agnes and Peter can understand. No wonder that William Friedkin (of Exorcist fame) would find himself drawn to directing the play's film adaptation. This excellent production of Bug, a long overdue regional premiere, stands out for being so well cast. Even when the pacing jolts forward in the second act, Keefe and Anderson maintain the palpable, isolating emotional bond that's so central to the play's conceit. Jones might have been more, well, biker-like, grizzled and rough, but that still doesn't stop her from going toe-to-toe with Hultquist's seething menace. As Dr. Sweet, Matt Ridge brings the right amount of ambiguity to his brief time on stage. The original print version of this article was headlined "Bugging Out"